Jayasree’s mother and veteran actress Vijayakumari presented the first copy of ‘Madhavi’, to Sarojini Kurup, wife of Jnanapith award winner ONV Kurup. THIRUVANANTHAPURAM: Jayasree Shyamlal is not a well known writer. Naturally, the release of her first novel could not have hogged the limelight.But the book release function was a nostalgic experience for attendees. Memories of the golden age of Malayalam drama came alive as wives of three stalwarts of yesteryears came together for the book release. Jayasree, daughter of late O Madhavan, one of the tallest personalities of the drama movement in Kerala, had the rare honour of growing amidst the leading lights of Malayalam theatre movement. After her father O Madhavan founded Kalidasa Kalakendram, one of the most respected theatre groups in Kerala, their house in Kollam became the epicentre of Malayalam theatre. Jayasree’s mother and veteran actress Vijayakumari presented the first copy of ‘Madhavi’, to Sarojini Kurup, wife of Jnanapith award winner ONV Kurup, in the presence of Suseela Devi, wife of novelist Vaikom Chandrasekharan Nair. “I have been cherishing my childhood memories of living with great literary figures as neighbours,” said Jayasree. Actor Mukesh, who is also the brother of Jayasree, Mukesh ‘s wife Methil Devika, Vaikom’s son and noted journalist Gowridasan Nair and Pravasi Sabdom editor M G Radhakrishnan Nair attended the function to share the nostalgia. Jayasree Syamlal said she had the rare opportunity to write down an entire novel dictated to her by the Vaikom Chandrasekharan Nair when she was a Class X student. Recognising her support, Vaikom wrote the the prologue in her name, Jayasree reminisced. It was Jayasree’s long cherished dream to release book in the presence of the ‘three mothers’.. 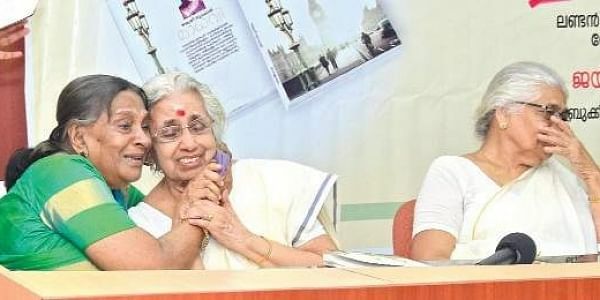 Releasing the book, Vijayakumari said she had the freedom to persuade ONV to pen poems for the plays staged by Kalidasa Kalakendram. When asked to speak about her memories, emotions came rushing into her mind. Sarojini Kurup’s words were choked as she took a stroll down the memory lane. Emotions overwhelmed Vaikom’s wife Susheela Devi’s words also.